BRIAN T. KENNEDY is president of the Claremont Institute and publisher of the Claremont Review of Books. He has directed the Institute’s Golden State Center in Sacramento and its National Security Project. A member of the Independent Working Group on Missile Defense and co-author of Shariah: The Threat to America, his articles on national security affairs and public policy issues have appeared in The Wall Street Journal, National Review, and Investor’s Business Daily. The following is adapted from a speech delivered on March 4, 2014, at Hillsdale College’s Allan P. Kirby, Jr. Center for Constitutional Studies and Citizenship in Washington, D.C.
Harold Rood, a professor of international relations at Claremont McKenna College who died in 2011, was not as well known as he was influential. A soldier in Patton’s army in World War II, he taught his students that war is permanent to the human condition, and that in war it is better to win, for no one ever had to accommodate a loser. America will always have enemies, he told them, and those enemies will forever be planning and expending resources to place themselves in a position to defeat us. It would be nice if it was otherwise, he was fond of saying, but it is not otherwise. It is the way the world works. The Hernandez family just moved out of their two bedroom apartment and into their very first home. Effrain, an Army veteran, and Valerie, an Army National Guard veteran, and their three daughters, Cecelia, and twins, Carmen and Cristine, are one of the 12 very-low income families moving into a first-of-its-kind Habitat Enriched Neighborhood™ for veterans in Sylmar, CA in April. On April 12, 2014, Habitat for Humanity SF/SCV and the California Department of Veterans Affairs (CalVet) hosted a Home Dedication/Key Ceremony at the Sylmar Habitat for Heroes site where the families received the keys to their homes. CalVet Secretary Peter Gravett and Los Angeles City Councilmember Felipe Fuentes attended spoke at the event. The Habitat Enriched Neighborhood™, named “Sylmar Habitat for Heroes”, was built by Habitat for Humanity San Fernando/Santa Clarita Valleys (SF/SCV) in collaboration with CalVet. It is the first community in the nation to provide homeownership to very-low income veteran families in a neighborhood context that also provides wrap-around social services free of charge to the families. These services, provided through partnerships with other local non-profits and businesses, include financial and health education, health screenings, and self-sufficiency training. Also unique are the services provided that meet the specific needs of the veteran community. These include art workshops for trauma victims, PTS counseling, FOCUS training, and ensuring connections to all entitled military benefits. This “Sylmar Habitat for Heroes” program was created to provide affordable homes for very-low income veterans and their families and also offer them the services and training needed to get out of poverty and move up into the middle class. Through this collaboration, low-income veterans qualify for four-bedroom homes, which they purchase using a CalVet Home Loan, a Habitat SF/SCV second loan, and a deferred silent third loan from California Department of Housing and Community. The Habitat for Humanity second loan is the key to making these homes affordable to low income veterans. On pay-back, funds will be reinvested into Habitat for Humanity SF/SCV’s efforts to build more homes for low-income veteran families and those in dire need of housing. CalVet selected Habitat for Humanity SF/SCV to collaborate with because of its Habitat Enriched Neighborhood model™, a model designed by and unique to the San Fernando/Santa Clarita Valley affiliate. The Habitat Enriched Neighborhood™ provides veterans not only with a homeownership opportunity which they would not otherwise be able to afford given their low income status, but also with enrichment services. These services are specifically designed to empower veterans with the knowledge, education and social services they require to become healthy and self-sufficient so that they can leverage their homeownership into a more economically advanced future for themselves and their children. To learn more about Habitat for Humanity SF/SCV visit www.HumanityCa.org. It has been obvious for years that the Pakistanis have been aiding the same jihadists that the U.S. government has been giving them billions of dollars to fight. The New York Times reported on that at length back in 2008. And now we learn that Ahmed Shuja Pasha, the head of the ISI, the Pakistani government’s spy service, knew the whereabouts of Osama bin Laden, and apparently so did many other top officials in the Pakistani government. Those who are surprised by this news probably also think that Islam is a Religion of Peace that has been hijacked by a Tiny Minority of Extremists. …After our first day of reporting in Quetta, we noticed that an intelligence agent on a motorbike was following us, and everyone we interviewed was visited afterward by ISI agents. We visited a neighborhood called Pashtunabad, “town of the Pashtuns,” a close-knit community of narrow alleys inhabited largely by Afghan refugees who over the years spread up the hillside, building one-story houses from mud and straw. The people are working class: laborers, bus drivers and shopkeepers. The neighborhood is also home to several members of the Taliban, who live in larger houses behind high walls, often next to the mosques and madrasas they run. President Obama today awarded long overdue Medals of Honor to five Californians who served our country valiantly during WWII, the Korean War and War in Vietnam. Although these men received the Distinguished Service Cross, the nation’s second highest military award back then, a review of Jewish American and Hispanic American Veterans through the Defense Authorization Act of 2002 found that these men were more than eligible to receive the Medal of Honor. •	Specialist Four Leonard L. Alvarado will receive the Medal of Honor posthumously for his courageous actions while serving as a Rifleman with Company D, 2d Battalion, 12th Cavalry, 1st Cavalry Division (Airmobile) during combat operations against an armed enemy in Phuoc Long Province, Republic of Vietnam, on Aug. 12, 1969. •	Specialist Four Jesus S. Duran will receive the Medal of Honor posthumously for his courageous actions while serving as an acting M-60 machine gunner in Company E, 2d Battalion, 5th Cavalry, 1st Cavalry Division (Airmobile) during combat operations against an armed enemy in the Republic of Vietnam, on April 10, 1969. •	Sergeant Eduardo C. Gomez will receive the Medal of Honor posthumously for his courageous actions while serving with Company I, 8th Cavalry Regiment, 1st Cavalry Division during combat operations against an armed enemy in Tabu-dong, Korea, on Sept. 3, 1950. •	serving with friendly foreign forces engaged in an armed conflict against an opposing armed force in which the United States is not a belligerent party. Lancaster, CA - The Lancaster Housing Authority (LHA) today announced a collaboration with the California Department of Veterans Affairs (CalVet) to offer affordable housing and home loans to veterans. Under the partnership, LHA will build the new homes, while CalVet will provide home loans to qualifying veterans. Over the past several years, the LHA has been successful in transforming foreclosed properties that could have once blighted a neighborhood into attractive, affordable homes ready for new owners who want to help contribute to making their new neighborhood a great place to live. Now, as part of this new collaboration, the LHA will construct brand new homes in Lancaster’s more mature neighborhoods on up to a dozen vacant lots which are already owned by the LHA. These new homes will be made available for purchase through the LHA, and will be marketed to veterans. The program is expected to begin during fiscal year 2014/2015. “CalVet is very excited about this collaboration, wherein the Lancaster Housing Authority will be building homes focused toward our veterans, and we will in turn provide loans up to the appraised value of the homes,” said Theresa Gunn, Deputy Secretary, CalVet Farm and Home Loan Division. "Through this collaboration we will be able to assist veterans in obtaining the American dream of homeownership." The CalVet Home Loan program is designed to help veterans save money, simplify the lending process, and help them protect their investment. CalVet offers home loans to veterans at below market interest rates with low or no down payment. In addition, CalVet Home Loans has expanded eligibility. According to CalVet, nearly any veteran wanting to buy a home in California is eligible. To participate in this new program, veterans must first qualify for the CalVet loan. The amount of the CalVet loan provided may not exceed the appraised value of the home. Veterans who are interested in obtaining a CalVet home loan may visit CalVet online at www.Calvet.ca.gov or call 1-866-653-2510. The Lancaster Housing Authority (LHA) provides a range of services, housing programs and projects designed to assist in the maintenance and improvement of the quality of life in Lancaster’s neighborhoods. The goal is to make every neighborhood a desirable place to live, work and play by encouraging development and redevelopment through strategic investment of public resources. These operations work together to prevent further blight by encouraging and fostering housing and economic revitalization by: protecting and promoting the sound development and redevelopment of the community; reinvesting in older and often overlooked neighborhoods, commercial districts and downtowns; and encouraging new development at the edges of the City to be more compact and pedestrian oriented. The California Department of Veterans Affairs (CalVet) works to serve California veterans and their families. With 1.8 million veterans living in the State, CalVet strives to ensure that its veterans of every era and their families get the state and federal benefits and services they have earned and deserve as a result of selfless and honorable military service. CalVet strives to serve veterans and their families with dignity and compassion and to help them achieve their highest quality of life. For more information, visit www.calvet.ca.gov. The California Department of Veterans Affairs (CalVet), the California Commission on the Status of Women and Girls, and the California State Library will host a reception “Celebrating Women of Character, Courage and Commitment,” in honor of Women’s Military History Week, recognized by the Governor as the third week of March. The reception will be held on March 19, 2014 from 5:00 p.m. to 8:00 p.m. at the California State Library, 900 N Street, Sacramento. The free reception will feature speakers from the California Legislature and an awards ceremony. Assembly Speaker John A. Pérez will be recognized for his work with the Commission and dedication to helping women and girls of California. Delphine Metcalf-Foster and Brigadier General Sylvia R. Crockett will receive the CalVet Trailblazer Award for outstanding service and achievements in the military and veteran community. “We are proud to recognize and honor California women veterans and two in particular who have made amazing contributions to our Armed Forces and to the fabric of our great nation,” said Lindsey Sin, CalVet Deputy Secretary for Women Veterans Affairs. To register for the reception or to read more about the awardees, please visit www.calvet.ca.gov/Women/MilitaryWeek.aspx. For more information, call (916) 653-1402 or email womenveterans@calvet.ca.gov. Los Angeles – More than 300 veterans gathered today at the California African American Museum to participate at the first Black Veterans Summit co-hosted by the California Department of Veterans Affairs (CalVet) and the Black Chamber of Commerce of Orange County. California is home to more than 1.8 million veterans, roughly one third of which identify themselves as minority veterans. Attendees from various ethnic groups listened to impassioned presentations by the Honorable Will A. Gunn, General Counsel, U.S. Department of Veteran Affairs and California State Parks Director Anthony L. Jackson, Major General (USMC Ret). In addition, panelists held frank and open discussions with participants on employment, health care, education and housing issues relevant to today’s veterans. Camarillo, CA - CSU Channel Islands (CI) will host an open hearing of the U.S. House of Representatives Committee on Veterans’ Affairs Subcommittee on Health on Thursday, Feb. 20, at 10 a.m. in the Grand Salon at the CI campus. The Subcommittee will meet in public session to conduct an oversight field hearing on the provision of mental health care services to Southern California veterans through the Greater Los Angeles Department of Veterans Affairs (VA) Healthcare System. During the field hearing, the Subcommittee will examine the use of community programs and resources – including faith-based and nonprofit entities – to resolve access to care issues for veterans and their families and further actions that may be needed to increase effective and meaningful partnerships between the community and the Department of Veterans Affairs. The Subcommittee will also assess the availability, use, and efficacy of alternative mental health treatments to treat veterans in need, where appropriate. The House Committee on Veterans’ Affairs Subcommittee on Health has legislative, oversight, and investigative jurisdiction over the Veterans Health Administration, including medical services, medical support and compliance, medical facilities, medical and prosthetic research, and major and minor construction. Congresswoman Julia Brownley (D-Westlake Village) is the ranking member. Limited parking is available on campus with the purchase of a $6 daily permit; follow signs to the parking permit dispensers. Free parking is available at the Camarillo Metrolink Station/Lewis Road parking lot in Camarillo with bus service to and from the campus. Riders should board the CI Vista Bus to the campus; the cash-only fare is $1.25 each way. Buses arrive and depart from the Camarillo Metrolink Station every 30 minutes from 7 a.m. to 10 p.m. Monday through Friday. For exact times, check the schedule at www.goventura.org. For more information on House Committee on Veterans’ Affairs and the Subcommittee on Health, visit http://veterans.house.gov/. POINT MUGU, Calif. – Coast Guard patrols have spotted a panga boat beached near Point Mugu Rock in Ventura County, Calif., and officials are searching for one or more suspects who may have fled the scene. At approximately 7 a.m., patrols reported the presence of a panga boat on the beach between Mugu Rock and Naval Base Ventura County, Point Mugu. An hour later, a possible suspect was spotted in the wetlands on the installation. Base police officers, in conjunction with Navy Criminal Investigative Service, are canvassing the area at this time. Ventura County Sheriff’s Department, California Highway Patrol and Customs and Border Patrol are on the scene at the panga boat landing site, where approximately 23 bales of an as yet unidentified substance have been found and secured. CHP has two suspects in custody near Deer Creek Road and the Pacific Coast Highway. The third remains at large and is described as a Hispanic male, 5’8”-5’11”, approximately 180 pounds, dressed all in black. Thousands of California veterans are now receiving financial compensation and health care benefits due to the effective collaboration between the California Department of Veterans Affairs (CalVet) and U.S. Department of Veterans Affairs (USDVA) Joint Claims Initiative. Veterans’ benefits claims which have been filed with the USDVA —some stuck in the federal system for more than two years—are now being expedited. As of January 30, 2014, with 21 members of the 36 approved staff hired, vetted, and authorized to review claims, the “Strike Teams” at the CalVet District Offices in Oakland, Los Angeles and San Diego have collectively reviewed 5,822 claims since September of 2013. The compensation awarded to veterans through these efforts is substantial: $1,865,139 in lump sum payments (meaning retroactive payments based on the time the claim has been sitting at the USDVA). Monthly award payments totaling $181,961 have been awarded to those same veterans. That means more than $2,183,532 in payments will be going to those California veterans every year for the rest of their lives. That is also money that comes right back in to California’s economy. The California Budget Act of 2013 authorized $3 million and 36 limited-term positions to create the CalVet/USDVA Joint Claims Initiative. The Initiative allows CalVet Veterans Claims Representatives access to claims currently pending over 125 day within the USDVA system which they then fully develop and package for rating. In FY 2012, veterans benefits brought more than $10 billion in federal benefits into California in the form of compensation, pension, health care, education, vocational rehabilitation, employment and other services. For a copy of the full Joint Claims Initiative status report, contact CalVet. 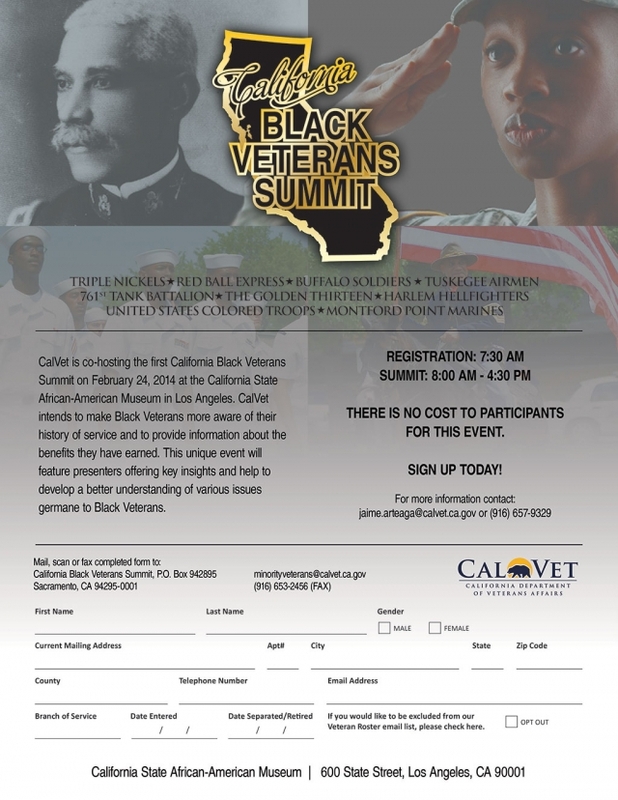 The California Department of Veterans Affairs (CalVet) is co-hosting a California Black Veterans Summit in an effort to develop lines of communications between the Black veterans’ community, black military history organizations, CalVet and the U.S. Department of Veterans Affairs. Black and other minority veterans have historically not applied for and used their veterans’ benefits. This summit will feature discussions on Housing, Employment, Healthcare, and Education benefits and services that will help develop multiple avenues of communications that will enable better access to services and facilitate greater access to earned benefits for all California veterans. Participation in the California Black Veterans Summit is free! More information about the California Black Veterans Summit can be obtained on CalVet’s website at www.cdva.ca.gov/Minority/BlackVeteranSummit.aspx. CalVet would like to include your event information on its online calendar. to Greg.Nannini@CalVet.ca.gov as soon as the details of your event are known. In preparation for the opening of the Skilled Nursing Facilities (SNF) at Redding and Fresno the Veterans Homes of California are launching a hiring blitz. Redding and Fresno veterans homes opened in October 2013 as Residential Care Facilities and have veteran residents and are now proceeding to open their SNF Units. To operate skilled nursing facilities requires more nurses, more LVNs, more CNAs and Supervising Nurses to manage the high levels of care CalVet demands for veterans. CalVet operates Skilled Nursing Facilities for veterans at Barstow, Chula Vista, West Los Angeles, and Yountville and recruits regularly in those areas. For this special recruitment effort CalVet has been reaching out to other state agencies such as EDD, professional and senior care associations and the community. Employees in all of the required positions must be in place prior to the SNFs being allowed to open by the California Department of Public Health, the licensing body for nursing homes in the state. The first Veterans Home in California was established in Yountville in1884 for Civil War veterans and will celebrate its 130 year of operation this year. It is the mission of the CalVet Homes is "to provide the state's aged or disabled veterans with rehabilitative, residential, and medical care and services in a home-like environment." This mission acknowledges the tremendous sacrifice California veterans have made and recognizes them for their noble service to our nation. The Homes range in size from 60 residents on a 20 acre site to over 1,000 residents on 500 acres. When all eight Homes are at capacity, they will house and care for approximately 3,000 veterans. Veterans who are age 55 and above and discharged from active military service under honorable conditions, are eligible to apply for admission. The age requirement is waived for disabled or homeless veterans needing long-term care. Information regarding the veterans’ homes can be found online at http://www.calvet.ca.gov/VetHomes. The site includes an application for residence, levels of care, and information and pictures of the individual homes. Written By Frank J. Gaffney Jr.
America is confronting a very dangerous nuclear “perfect storm.” You might be forgiven for thinking that prospect has sufficient importance to warrant mention in President Obama’s State of the Union address. California veterans can proudly display their status with VETERAN license plates which are again available. A new law brought the California specialty license plates back at the request of veterans who were disappointed when VETERAN license plates which had been available were replaced by an “Honoring Veterans” version. Honoring Veterans license plates are still available, so both veteran and nonveteran drivers can honor military service. VETERAN license plates can be customized with the distinctive military branch or veterans service organization logo of choice. Proceeds from the sale of these plates help support efforts of CalVet and 56 county veteran service offices to connect veterans and their families with the benefits and services they have earned through military service. VETERAN plates can be reserved now, but they are not immediately available. According to the new law, CalVet must collect and hold pre-paid VETERAN license plate applications until 7,500 are received before the Department of Motor Vehicles (DMV) will actually produce the plates. Once that threshold is crossed, DMV will produce the plates and take responsibility for processing future applications. That same “hold and wait” process applies to all new specialty license plates approved in California. For more information or to reserve your VETERAN license plates, go to http://www.calvet.ca.gov/VetServices/VeteransPlate.aspx to download the application. You may also call CalVet at 877-741-8532 toll free to request a VETERAN license plate application be mailed to you. Honoring Veterans license plates can be ordered by following that same link. The veteran license plate program is a partnership between the California Department of Veterans Affairs the California Department of Motor Vehicles, and the California Association of County Veterans Services Officers, Inc. THOUSAND OAKS, CA - California Lutheran University is launching a Veterans Entrepreneurship Institute in January as part of an increased emphasis on preparing people to create their own business opportunities. THOUSAND OAKS, CA - U.S. News & World Report has ranked California Lutheran University fourth among regional universities in the West on its inaugural Best Colleges for Veterans list. To qualify for the rankings, universities had to score well in the 2014 edition of the U.S. News Best Colleges, be certified for the GI Bill and participate in the Yellow Ribbon Program and Servicemembers Opportunity Colleges Consortium. There are a total of 24 institutions in 15 Western states included in the regional universities ranking. “We developed these rankings to help (veterans) find a top-quality institution that also offers federal benefits that ease the burden of applying, paying for and completing a college degree,” said Brian Kelley, editor and chief content officer for U.S. News. CLU goes beyond participating in national programs in its quest to help veterans. Earlier this year, the university hired its first veterans coordinator, alumna Jenn Zimmerman, to organize events and help veterans with enrollment, financial aid and academic issues. As a student at CLU, the Navy veteran launched a Military Veterans Club in 2012. In January, the School of Management will offer a Veterans Entrepreneurship Institute to help former service members either start their own businesses or improve their prospects in the job market. CLU’s California Institute of Finance has an interactive website where veterans and active duty personnel can meet, exchange ideas and learn about an online MBA program. CLU ranked 18th among regional universities in the West in the overall 2014 U.S. News Best Colleges list released in September. The university’s scores improved in several categories including average freshman retention rate, alumni giving and academic qualifications of incoming students. With an enrollment of about 4,300 students, CLU offers undergraduate and graduate programs within the College of Arts and Sciences, School of Management, Graduate School of Education and Graduate School of Psychology. In addition to its main campus in Thousand Oaks, it has centers in Oxnard, Woodland Hills and Santa Maria for graduate and Bachelor’s Degree for Professionals programs. Members of the CLU student body come from across the nation and around the world and represent a diversity of faiths and cultures. Sacramento, CA – Hundreds of people gathered today in Capitol Park to witness the re-dedication of the California Vietnam Veterans Memorial. Originally dedicated in 1988, the California Vietnam Veterans Memorial has stood as a testament to the 5,823 men and women who made the ultimate sacrifice at the request of our Nation. “I am honored to see so many people here today with us to honor and remember, not only the men and women who lost their lives in Vietnam during that very unpopular war, but also those who came back, became parents, artists, community leaders or most importantly, our neighbors and loved ones,” said Peter J. Gravett, CalVet Secretary. The ceremony today involved three parts. The first was a motorcycle run with more than 300 riders making their way from Raley Field to the memorial. A beautiful solemn ceremony in honor of Prisoners of War and those still Missing in Action took place following the motorcycle ride. The main ceremony involved some very heartfelt speeches by Sister Linda McClenahan, Chairwoman of the California Vietnam Veterans Memorial Committee; Stan Atkinson, longtime friend of B.T. Collins and supporter of the memorial; Peter J. Gravett, CalVet Secretary; and Col. Rocky Chavez, CA State Assembly. Two very poignant events during the ceremony included the unveiling of PFC Ralph Henry Johnson’s newly engraved name. PFC Johnson is a Congressional Medal of Honor Recipient. The other touching moment came when several wreaths were laid at the memorial by different veterans’ service organizations. These two occasions brought many of the attendees to tears. The ceremony concluded with a touching rendition of Amazing Grace by the Scottish American Military Society. Event: The California State Archives is hosting an exhibit of personal mementos and tributes left by visitors to the California Vietnam Veterans Memorial in Capitol Park, Sacramento, CA. Admission is free. Bonus: This exhibit will be open to the public on Saturday, November 23, 2013, 11:00 a.m. to 4:00 p.m.
Background: Coinciding with Veterans Day and the 25th anniversary of the California Vietnam Veterans Memorial in Sacramento’s Capitol Park, the California Secretary of State’s Archives Division has mounted a new exhibit of items placed at the memorial. Mementos include uniforms, hats, medals, patches, poems, posters, correspondence, and even a bullet-riddled helicopter blade. Since the memorial’s opening in 1988, visitors have left more than 1,500 items of personal or historical significance at the site. Items left at the site are transferred to the State Archives.